Hollybeary Creations : Let's Party!!!! Hi everyone... Happy Saturday! 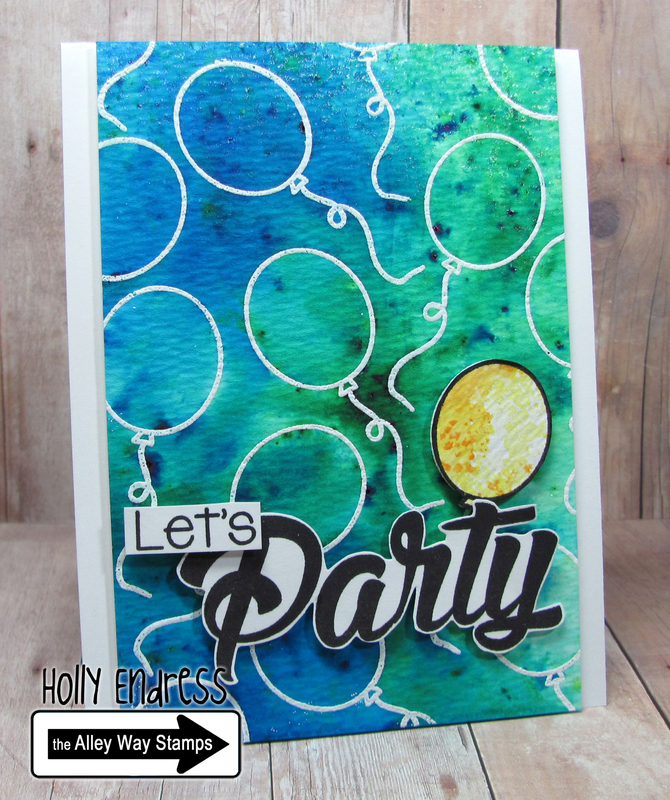 Today I have a Bright fun card using some Ken Oliver Color Burst powders to create a watercolored background. 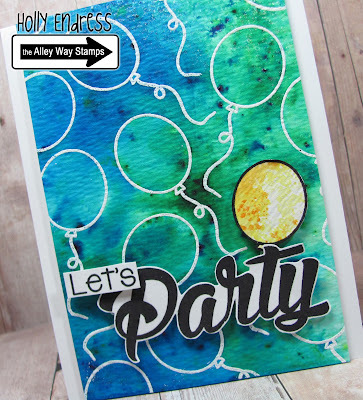 We're using two of the newest sets from the Alley Way Stamps called Big Time and Party Pooper.. Party Pooper is Free all month long with any $40 purchase. 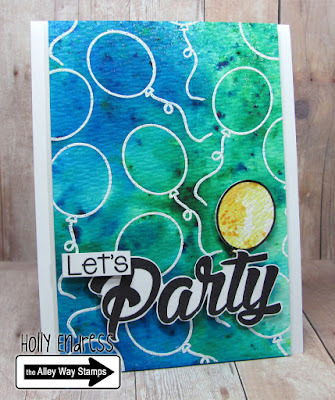 I heat embossed the ballon image from Party Popper in some White embossing powder on a piece of Tim Holtz watercolor paper and then I added some Green & Blue Color Burst powders and spritzed them with water. Once that was dry I trimmed the card stock panel to size and added it to a White A2 top folding card base. Then I stamped the Let's Party from Big Time in some Black Lawn Fawn ink and trimmed it out and adhered it to the front with dimensionals. I had a piece of paper from a previous project on my desk that I used some Yellow Distress ink on and I stamped the ballon again and trimmed it out and added it to the background. I have a crafty tip today.. I learned that the Lawn Fawn inks do not work with Glossy accents or at least the Black doesn't. Once I had applied some glossy accents the ink started running and turned the glossy accents yellow. I had to remove that and start over.. So just a hit you want to test any inks with Glossy Accents before you add them to your projects. Head over to the Alley Way Stamps blog for more fun inspiration.. and be sure to join us on Sunday for the October New Release Sneak Peeks! Beautiful background. Such a pretty card.